The time is spring of 1774. 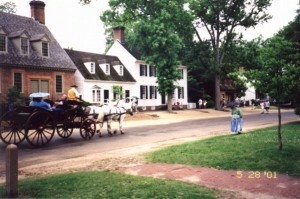 The place is Williamsburg, Virginia. America, not yet an independent country, is a group of 13 colonies in the British Empire under British rule. When Great Britain colonized America there was no master plan on how the colonies would be governed. Some colonies governed themselves, while others were governed by Great Britain. The British passed laws and forced taxes that were in the best interest of Britain, not the colonies. While the British continued to enforce their control over the colonies, they refused to allow the colonies government representation in Britain. The British believed that their own appointed government officials adequately represented the colonies. As a result, the colonies resented British control. Therefore, the colonies created their own laws and ignored the British laws they did not like. This created considerable tension between Great Britain and the colonies. For several years prior to 1774, the British government had imposed several new taxes on the colonies. The colonists first reacted by refusing to buy British goods while rallying behind the phrase, “No Taxation without Representation”. Britain was forced to remove all taxes, except for the tax on tea. To demonstrate their unhappiness with the tea tax, a group of patriots led by Samuel Adams dressed up like Mohawk Indians and threw boxes of tea off a British ship into the Boston Harbor. This event became known as the Boston Tea Party. In response to the Boston Tea Party, Britain passed several acts to punish Massachusetts, including the closing of the port of Boston. The Virginia colonists showed their support of their northern neighbors by observing a day of fasting, humiliation and prayer. The people from the different colonies then joined together in a united front and formed the Continental Congress to seek their independence from the British. 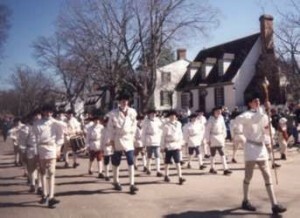 From 1699 to 1780, Williamsburg was the capital of the colony of Virginia. In this historic town, George Washington, Patrick Henry and other patriot leaders plotted America’s freedom from Great Britain. Here, Thomas Jefferson studied law, and later wrote the Declaration of Independence. Today the 173 acre historic area of Williamsburg is restored to its original 18th century appearance. 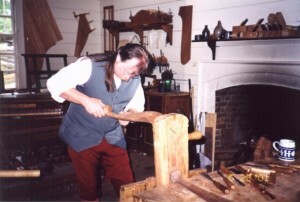 Over five hundred buildings, eighty-eight of which are original structures, re-create the town and over thirty colonial trades, such as brick making, cabinet making, weaving, shoe making and bookbinding bring the town to life. The time portrayed is that of the 1770’s, just prior to the American Revolution. In this living museum, townspeople, or “interpreters” as they are called, live and work within the town and literally bring the 18th century era to life. 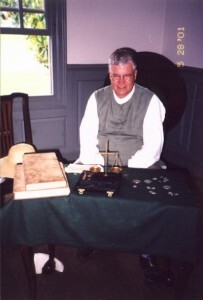 Throughout the historic area these interpreters perform tasks as they would if they lived in the 18th century. 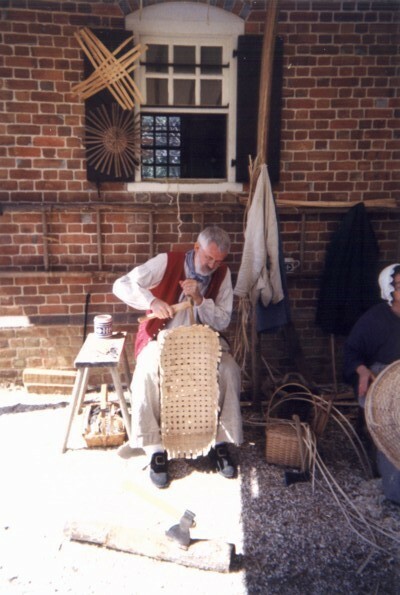 There are working silversmiths, blacksmiths, gunsmiths, milliners, printers, wig makers, basket makers and tavern owners. There are also people playing the role of famous Revolutionaries of the time like George Washington, Thomas Jefferson and Patrick Henry. A stroll down the charming Duke of Gloucester Street surrounds visitors with sites and sounds of colonial life in the 18th century. 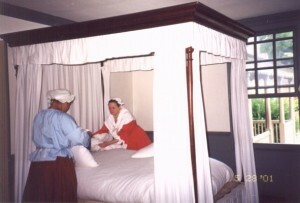 Visitors are encouraged to interact with the interpreters and participate in the colonial culture. 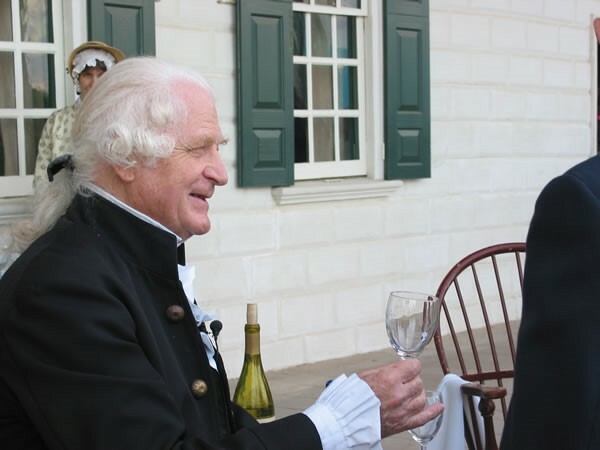 This may include a visit to the House of Burgesses to listen to prominent Virginia statesmen debate politics or a candlelight dinner at Christiana Campbell’s tavern, one of George Washington’s favorite eating establishments or perhaps a conversation with some of the following people. Pleased to make your acquaintance, I am George Washington. Initially, I was slow to warm up to the revolutionary fervor, I had hoped that the British would mend their oppressive ways. I became greatly disappointed in England’s new policies of taxation and strict regulation of our economy. I must admit that I was also disappointed with the discrimination between British and colonial officers in rank and pay. I am now a firm believer in American Independence. Having recently been voted as a delegate to the First Continental Congress, I am confident we will resist British rule. Good day, I am Anthony Hay. My craft is cabinet making, I operate one of seven shops in Williamsburg. Please don’t be fooled by the name, I make all types of fine furniture, not only cabinets. The demand for locally produced furniture has greatly increased since the British goods boycott began. In fact, we have so many outstanding orders that I’ve had to hire another apprentice. The average apprenticeship is from five to six years, however the length of the apprenticeship varies from trade to trade and is usually based on the achievement of a skill level rather than on the amount of time worked. Good day, I am Daniel Adams. In my spare time I make baskets and sell them for additional income. Baskets are a necessity and are used for carrying and storing goods. They can be made from hickory, willow, oak or cedar. 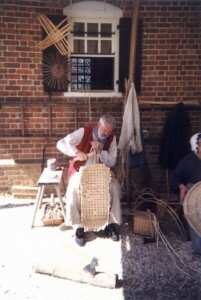 Basketmaking is not a formal business, rather baskets are made in the home and sold privately. Many other day to day necessities and crafts are made in the home as well. My wife helps out by sewing trousers for me and dresses for our daughter. Sewing is an important part of a young girl’s education, so my wife is teaching our daughter to mend clothing. In addition to making clothing, soaps and candles are made in our home as well. The women store cooking grease and animal fat all year long for soap making day, a yearly event held each spring. Pleased to make your acquaintance, I am Samuel Smith. I’m the banker in town, although we don’t exactly have a standardized banking system. Britain has not supplied us with sufficient coinage and to make matters worse, they have prohibited us from making our own. The early settlers brought coins from Europe however the coins went right back to Britain to pay for supplies. At the present time, the most trustworthy coin is the Spanish dollar, known for its consistent silver content. To make change, the dollar is cut into eight pieces or “bits” which are carefully weighed on my scale. These bits are then used to pay for goods and services. Good day, I am Rose. I am one of several servants working for the Powell family. I have a number of duties that include tightening the bed ropes, making the bed, dusting the furniture and sweetening the bedchamber, by sprinkling fresh herbs in the room. Once my household duties are complete, I help with the gardening and laundry. Slavery is common in Virginia, almost 40% of the population is of African descent. However, not all Africans are slaves and not all slaves are Africans. Occasionally white settlers who arrive in Virginia come as indentured servants. They generally have to work seven years for a master in exchange for their passage to the new land. Once their time has been completed, they receive a customary freedom due and can marry and take up a small farm of their own. While in Colonial Williamsburg, visitors will actually be transported back to one of the most fascinating times in our country’s history. But Colonial Williamsburg is not simply a museum of restored buildings and artifacts. It’s a living community where merchants sell their wares, craftspeople ply their trades and brave patriots whisper plans for revolution. For those who are fans of wineries, the Williamsburg Winery is a must. Located on a 320 acre farm, the main building is representative of the 17th and 18th century architectural style. Williamsburg Winery takes their wines very seriously. They have a beautiful tasting area, complete with a long wood bar. The tasting costs $6 and includes a guided tour of the winery, a tasting of 7 wines and a monogrammed tasting glass for guests to take home. It is a scenic winery with picturesque grounds that is well worth the trip. 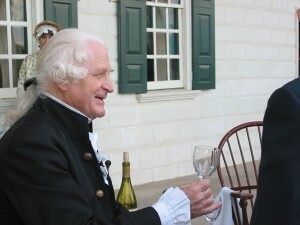 For more information, call (757) 229-0999 or visit www.williamsburgwinery.com.